Coming to the home stretch as it pertains to A NIGHTMARE ON ELM STREET. One supposedly bad movie in the sixth, and one supposedly decent movie with the seventh left. Can’t watch the good ones without also getting through the weaker ones, so six got watched (despite my better judgment). I stayed up. My wife was out within forty minutes. She’s a wimp. Or maybe she’s just smarter than me. 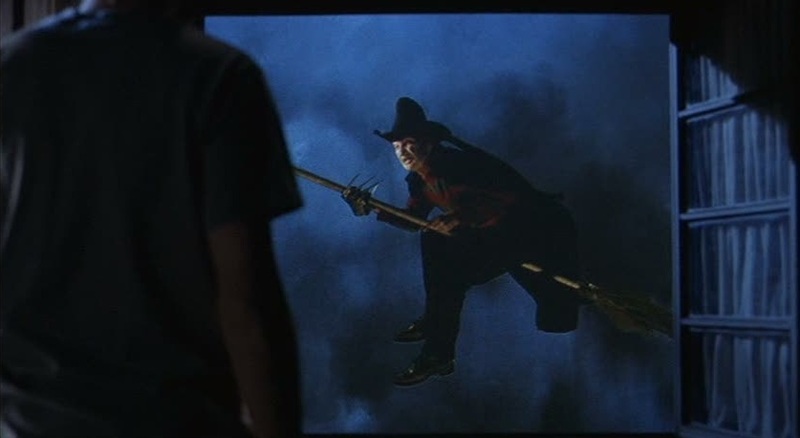 I watched FREDDY’S DEAD: THE FINAL NIGHTMARE (1991) on 10.23.14. It was my first viewing of the film. This film returns to the reality established by the first film, where events that happen in the dream world manifest in the real world. Also, a last scene with Freddy (Robert Englund) without make up is a nice nod to the actor hidden through the previous five plus movies. If the movie were ten minutes long (and we eliminated the 3D), and started with the scenes showing Freddy’s past? This might be the fourth or fifth best movie out of six. And that is the extent of what this film gets right. What does it get wrong? That’s a long list. The acting is terrible. The writing is brain dead. The filmmaking is inept. The music is a knock off of early 90s grunge, but a bad knock off. The 3D of the last thirty minutes is brutal (I could tell, even though I did not watch it in 3D). Freddy becomes a comedic farce of himself. The movie references the Nintendo Power Glove. This is a film which has useless cameos by Rosanne Barr, Tom Arnold, and Alice Cooper (with one admittedly decent return cameo by Johnny Depp). The kills, which the audience supposedly comes for, are few and uninteresting. The movie gets repetitive in the overuse of a falling motif. There is a scene where a kid falls asleep and the map he is holding becomes a giant map which, I don’t know, maybe is supposed to drown him or something. But the map is clearly a poorly designed prop which is nothing but a bunch of maps taped together. With some of that out of the way, we can consider this film’s place in the series. There have been decent entries (1), not quite there entries (5), solid entries (3), bizarre entries (2), and just plain boring entires (4). Six is ambitious. It is just out-right terribly bad. The writing is crap, the filmmaking is unable to maximize on the improved technology, and the situations are bizarre. An elaborate kill sequence revolves around a kid’s hearing aid being turned up too high. He is tortured to death by dropped pins and Freddy’s knives dragged across a chalkboard. It’s just stupid. It is hard to tell what they are even going for there. At a certain point, you watch a movie and begin to actively wonder where that movie falls on your personal list of worst movies of all time. For me, I had that thought four times in the first four minutes (for example, whenFreddy flies outside a window on a broom and quotes WIZARD OF OZ). The thought reoccured every ten minutes or so, usually spiking at the moment of death for yet another uninteresting character. The last scene probably pulls this movie out of the top five worst movies of all time. Yet the ending sequence, which highlights the series up to that point during the credits, can’t help but demonstrate how insufficient this ‘last movie’ was when compared to an exceedingly mediocre series. The fact that it turned out not to be the FINAL NIGHTMARE is probably a good thing, because no series deserves to go out on a such a terrible note. ~ by johnlink00 on October 23, 2014. I’ve always found that if I could skip the first half, the second half is watchable. I guess by six you really do run out of ideas. Nice review.